Keep on your toes or at least on your feet with Medline’s Double-Tread Slippers. These socks are just one of many great products for fall protection. Not only are these socks incredibly safe for any kind of patient, but they are incredibly comfortable. Sliding on and off easily, geriatric patients wear these just as easily as patients coming out of a surgery or someone wearing them simply for the comfort and warmth with no medical concerns. 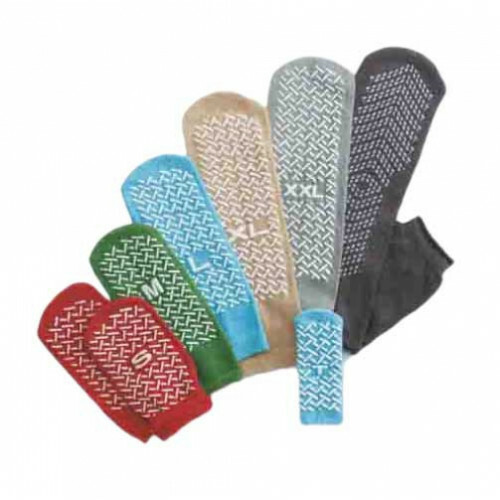 These Non-slip SocksNon-slip Socks come in both double tread and Single Tread options so you can determine how much grip is needed. The interior is made of terrycloth to absorb perspiration, keeping your feet dry and preventing athlete’s foot and other conditions. It is also completely latex free and stretchable, making it a great option for everyone. As an added convenience, the socks are color coded according to size to make it easier to find the best fit. Red equates to small, green is medium, large is blue, extra large is beige and the grey is extra large.